In this post, I will try to connect a set of equations with matrices and vectors in a way that isn’t simply a notational shift. In part 18 of this series, I brought up the vast preponderance of square matrices (a matrix with the same number of rows as columns) and wondered why school mathematics tends to have us think that matrices somehow always have to be square. This issue is of more than casual interest, since you constantly see students confuse rows and columns. The signifiers that make it clear what each row means and what each column stands for – those are exactly the signifiers that are missing from the accepted standard notation for matrices, presumably for reasons of compactness. Let’s use our Bill Amend comic strip once again, and look at the problem as stated by the brother in the third panel. The steps involved in solving these equations, at least till the point where we nailed one of the unknown numbers, all correspond to row operations on the matrix and known vector. In a system of equations, written in either of the ways I’ve shown, you can freely multiply a row by any number you like, and freely replace a row by the sum or difference of that row and another row. Yet you may have solved the system of equations by thinking about the shirts and the sweaters differently. Is it easy to establish which costs more, a shirt or a sweater? I think it is, since I can imagine walking the first order to the cash register, seeing that it costs $60, and then putting a shirt back on the shelf and grabbing an extra sweater instead. The order now costs $75, and the extra $15 must come from the extra sweater costing $15 more than the shirt I put back on the shelf. So a sweater costs $15 more than a shirt. This still doesn’t exhaust the ways in which you might have reasoned about shirt prices and sweater prices. You may have noticed that if you first walk the first order to the cash register and then the second, you end up with a total of 3 shirts and 3 sweaters, for which you would have paid a total of $135. 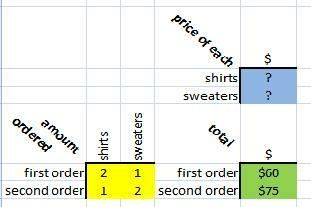 From that, you might conclude that a single shirt and a single sweater must cost $135/3 or $45. The first order is like a single shirt and a single sweater – with an extra shirt. The difference between $60 and $45 must account for the single shirt. Similarly, you might have noticed that the second order is like a single shirt and a single sweater, but with an extra sweater. This extra sweater cost $75-$45 = $30, so sweaters cost $30. How did Paige think about the shirts and the sweaters? The comic strip doesn’t really tell us one way or the other. What the comic strip does suggest very strongly is that Paige can think in terms of shirt and sweaters, but not in terms of x and y. For us, there is a similar issue whenever we see a matrix. What does each row stand for? What does each column stand for? If we don’t know – if we can’t talk about the second row and the first column of the coefficient matrix as the number of shirts in the second order – then we can’t do better than talk about the number in row 2 and column 1. Just maybe, the amazing thing is that some people do not get confused. This entry was posted in Uncategorized and tagged denominations, matrix multiplication, models, naming, representations, whole vs. parts. Bookmark the permalink.